There comes a point when changing one's life for (hopefully) the better, when you find yourself at the intersection of who you were, who you are and who you are becoming. And at this point, I find that you can stay where you are and cling to the past or you can let go of what you've always known and embrace instead what is coming. But letting go is freaking difficult! So many things have shaped my identity over the past 23 years that I've been outside of the womb. It's quite tough to let go of all that stored muscle and mind memory because who am I without it? Surely, it is vitally important for me to keep my old habits of perfectionism and the mindset that it's better to be quiet than risk alienation from my friends? Surely, as a self-confessed introvert I should be a recluse and shouldn't enjoy going outside as much as I do? But I've found it helpful to remember that the prospect of who I am becoming will very quickly fill in the gaps that had once been filled by the old me. Who wasn't necessary bad, I just have no need for her anymore. I don't need to be a perfectionist, I don't need friends who I can't be honest with, I don't need to cling to labels (and the often incorrect assumptions attached to labels) that limit my ability to enjoy a full life. I've outgrown that person, and it's fine! In order to allow change in my life, I need to remember that I am allowed to change. There's always that back track playing on a loop voiced by all the people who've known me asking "who do you think you are?" and "this isn't you." Imagined or otherwise, I have to remember that regardless of who I was, what I liked, who knew me previously or who knows me now, I am entitled to change - my mind, my lifestyle, my opinions - I am entitled to being different now. I wasn't a fan of mushrooms and eggs until I became a proper breakfast person. I didn't like Stan Smiths until I found a pair that I have to convince myself not to wear everyday lest I wear them out. I didn't grow up thinking I was pretty and now I do and my mirror is my friend. I thought I wanted everyone to like me but now I'd rather just be honest. I thought I wanted to be friends with the cool kids but now I just want to be surrounded by good people. I anticipate that I will change again in a couple of weeks, months, days, years. But the point is, I am what I am, until I am not. 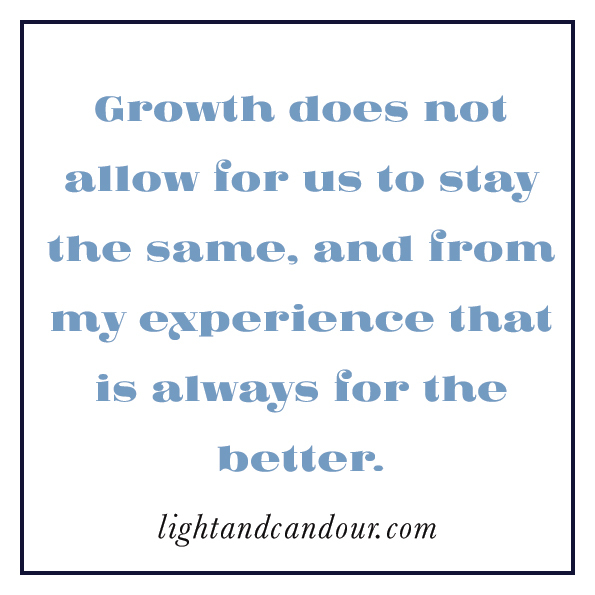 Growth does not allow for us to stay the same, and from my experience that is always for the better. For more from me follow @lightandcandour on Twitter!